I’ve updated the public mental ray UI for 2013. 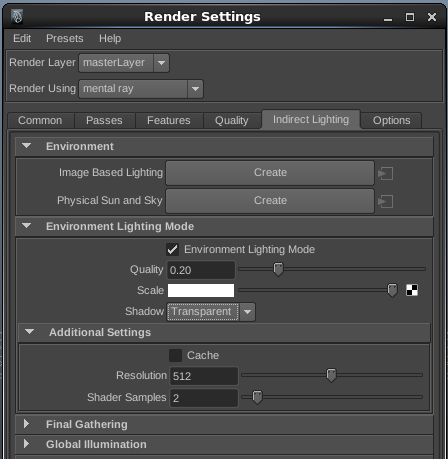 One big change is native environment lighting mode integration. Please note this does not currently work for SAP as Autodesk has altered a .mel file. You can find the initial release UI for Maya 2014 starting here. I am a VFX developer specializing in 3d rendering. With a background in Physics and Digital Art, I enjoying using math to explain how light interacts with materials and to creating pretty pictures along the way. Posted on January 16, 2013, in Uncategorized. Bookmark the permalink. 34 Comments. Will this one work with 2013.5? The previous version would not. Evidently not. That’s definitly something you want to report on the issues page. Dang, we talked about that on the forum and I meant to report previously but forgot. My bad! Will do so when I get a second. Are there any features that might break 2012? I’ve not tested it but have been told it works for 2012. So far, it seems to work well in 2012. i-ray is buggy and crashed, but last I checked, that was normal. Awesome!! thanks I have been waiting for this addition yay! Thank you for the update, what’s the Environment Lighting Mode? It’s a dome light for lighting a scene using and HDRI and nothing else. This means you get better lighting without using a lot of Final Gathering. I will try and post an explanation soon, maybe this weekend. Thank you it will be helpfull I don’t understand the exact differece between this and the standard IBL.. The standard Maya IBL “emit light” is older technology. It’s slower and harder to control. This one is faster and easier to create good lighting automatically. I’ve been creating and using the smart IBL / ray switcher IBL technique instead of using a Maya IBL, as I sometimes want different reflection and FG maps. Can the environment lighting mode be used with this technique as well, since I’m not using a typical Maya IBL? Also, I’ve been reading a lot of posts you’ve written about Native IBL vs user_ibl_env shader. When referring to the native ibl, are you referring to the built in Maya IBL? I have not used the smart IBL so I don’t know what it is using to generate light. The environment lighting bakes what is on the camera and uses that as direct area lighting. You should not need to replace the environment for FG quality reasons because when it is used, FG ignores environmental contribution (it’s already taken care of with the direct environment light) and instead only contributes object to object indirect lighting. We prefer Native/Builtin IBL to user_ibl_env because it tends to perform better for speed/noise despite the extra step of baking a texture that inherently loses some details. user_ibl_env does not rebake the environment and retains those details. We are NOT referring to the Maya mentalrayiblShape ’emit light’ option. DO NOT USE THAT! You can however use the mentalrayIBL shape to add an environment image or texture for the Native/Builtin IBL to use for lighting. I’ve switched over to this script on my daily production and so far, it’s working pretty nicely. I did run into a bug and thought I’d report it here. After switching over to unified, making some adjustments, I noticed I wasn’t getting nice AA edges on some cloud particles, so I switched back over to adaptive sampling, and the problem still persisted, as MR was rendering in unified still. I had to go into my string options and manually remove the unified strings to switch back to adaptive correctly. Are you using this in 2012? Both of those issues seem to be fixed in 2013. Ah, I am on 2012. That’s probably it! I’ve been using it with 2012–it seems to working fine. Either way, please report bugs on the google code page! Im using Maya 2013 SP2 on mac. I thought the issue might have something to do with my user preferences, so I threw out my prefs, but no luck. Definitely great! We’ve been using it in production since back in September. Thanks for all the hard work guys! My only question is under the motion blur tab for unified sampling, I don’t see any boxes for motion blur quality adjustment, just motion steps. I see it in the rasterizer, (Motion samples, and Shading motion quality) but not in the regular unified sampling. These seem to have disappeared. Is that correct? I know it’s a brute force technique, but it would still be nice to adjust the motion blur seperately. I’m still getting pretty grainy results with high settings. Hey Blake, Shading Motion Quality (formally Motion Quality Factor) controls the mental ray string option “rast motion factor” and is rasterizer only. The option lowers the shading quality for fast moving triangles and is not relevant for raytraced images. One of the things we hoped to do with the UI was to hide settings that don’t have any affects on your scene. For raytraced images, the best thing you can do to lower motion blur grain is to increase global sampling. This is achieved with unified sampling by increasing the Quality, i.e. “samples quality”, control. Scenes with high global sampling counts tend to perform better with fewer local samples (e.g. light samples, glossy samples, etc.). We to refer to this as the ‘brute force’ approach. Raytraced motion blur will inherently have more grain than rasterized motion blur—that’s why rasterizers have been so popular for such a long time. However the adaptivity of unified sampling makes ‘low grain’ raytraced motion blur achievable in a reasonable amount of time. thanks for the quick reply! Very well explained. What’s usually the highest you’ve gone, as far as samples quality to get smooth raytraced motion blur? – You’ve set all your local samples low (generally 1-4 samples). Your render time will go through the roof if you don’t do this. – Max Samples is not clipping your motion blur quality. You may need to raise this setting if 100 spp is not enough to smooth out the grain. – Adding in an Error Cutoff of 0.01-0.03 may help your render time. Keep in mind if the purpose is animation, you don’t need a perfectly smooth blur. A little noise isn’t noticed in motion and can save you a lot of time tweaking and rendering. Only go for perfectly smooth motion blur if you need a still image. any idea? bad installing? stupid user use of maya? These scripts run using the regular Maya Render Settings button. You don’t run these through the mel command line. These are called using the usual Maya UI mechanisms without having to remove or replace the ones in the Maya directories. This is what makes them convenient for non-administrators and non-destructive to your installation. Try just clicking the Maya Render Settings button and these should open instead.